It's hard to imagine that the quiet village of Eyam, off the A623 in Derbyshire, could have such a fascinating, yet tragic story to tell. But .... at the end of August 1665 bubonic plague arrived at the house of the village tailor George Vicars, via a parcel of cloth from London. The cloth was damp and was hung out in front of the fire to dry, thus releasing the plague infested fleas. On 7th September 1665, George Vicars, the first plague victim, died of a raging fever. To minimize cross infection, food and other supplies were left outside the village, at either the Boundary Stones, or at Mompesson's Well, high above the village. The Earl of Devonshire, who lived at Chatsworth House, freely donated food and medical supplies. For all other goods, money, as payment, was either purified by the running water in the well or was left in vinegar soaked holes. 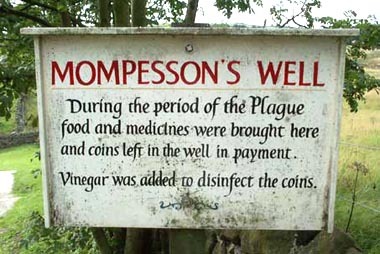 The Plague in Eyam raged for 14 months and claimed the lives of at least 260 villagers. By 1st November 1666 it had run its course and claimed its last victim. Eyam's selfless villagers, with their strong Christian convictions, had shown immense personal courage and self sacrifice. They had prevented the plague from spreading to other parishes, but many paid the ultimate price for their commitment. Almost 350 years later a remembrance service is still held every Plague Sunday (the last Sunday in August) at Cucklett Delf, Eyam. There is much to see in Eyam including the museum that gives details of the local history. The church has a magnificent Plague Window. 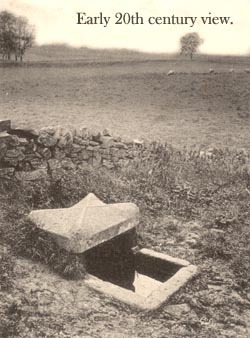 The water supply to the village dates back to the 16th century and artifacts are easily discovered, partucularly the stone troughs on Hall Hill. Eyam Hall is another attraction near a refreshment facility in the village.